A unit linked fund is type of collective investment, sometimes known as an insured fund, offered by insurance companies. Collective investments allow you to combine your money with that of other customers in order to invest in a wider range of assets than if you were investing on your own. Fund managers then invest the collective money into various assets in line with the fund objectives. Here at Utmost Life and Pensions our unit linked funds are mostly invested in other collective investment schemes managed by Schroder Investment Management Limited. These investments can include other collective investments, such as unit trusts and Open Ended Investment Companies (OEICs), as well as directly investing in stocks and shares, bonds, property and cash. Premiums you pay for your life policy or pension are allocated to units in your selected fund or funds. You will share any gains or losses of the fund with the other policyholders who have selected that fund. Your policy documentation and regular updates will show which funds you have selected and how many units you have been allocated. Because our products have different policy terms and conditions, when you choose a fund you may notice reference to a series. You are allocated units in a series within your selected fund according to which investment product you have chosen and the charging structure. When investing, remember the value of your investment can go down as well as up and you may get back less than the amount paid in. Our funds have different risk ratings and you will need to select a fund which matches the level of risk you are willing to accept. What’s the difference between risk ratings? Here at Utmost you can choose from three different risk ratings; minimal, medium and higher. These are designed to provide an indication of the potential level of risk and reward that is attributed to each fund based on the types of assets which are held within the fund and how the fund is managed. Other companies may use different descriptions and so it’s important that you don’t compare our risk ratings with other investments you may have, or compare another company’s risk ratings with your Utmost investments. How do the Utmost risk ratings work? What is a minimal risk rated fund? Utmost funds with a minimal risk rating are suitable if you are only prepared to take a minimal level of investment risk. If you have an Utmost life policy you will choose to invest in the Life Deposit Fund. The Life Deposit Fund is primarily invested in the Schroder Sterling Liquidity Plus Fund. This fund invests in a portfolio of money market instruments, short term bonds, and other fixed and floating rate securities issued by governments, government agencies, corporate issuers and financial institutions. The Life Deposit Fund also has cash deposits with leading banks and other financial institutions in the United Kingdom at the highest available interest rates consistent with maintaining maximum security of capital. The fund should not be regarded as a long-term investment but is particularly suitable to preserve the value of investments when the investment outlook is uncertain. The prices of accumulation units in the fund are guaranteed not to fall. you will want to maintain your policy value with very little, if any, chance of further growth. you will not want any fluctuations in value. What is a medium risk rated fund? Utmost funds with a medium risk rating are suitable for you if you are prepared to take a medium amount of risk to increase your chance of achieving a level of growth over the medium to long term. If you have an Utmost life policy you will choose to invest in one of three medium risk rated funds: Life Managed Fund, Life Fixed Interest Fund and Life Property Fund. The Life Managed Fund can invest in all asset classes and is the fund to choose for a medium risk investment leaving the investment decisions to the fund managers. 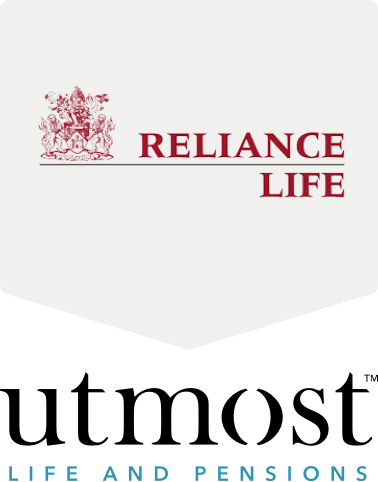 The fund will invest primarily in the Schroder Reliance Life Balanced Fund which has an investment objective to provide capital growth and income by investing in equities, bonds and cash from the UK and overseas. The fund will also invest in other collective investment schemes managed by Schroders. you accept that there is an increased likelihood of fluctuations in the value of your policy and that you may get back less than you paid in. The Fixed Interest Fund aims to achieve a high income return together with capital growth by investing in fixed income securities including corporate bonds, preference shares and convertibles. The Fund will invest primarily in UK based securities but may extend to any economic sector or geographic area and can invest in cash. The Life Property Fund will primarily invest in the Schroder UK Real Estate Fund. The aim of this fund is to invest in UK properties and to diversify risk by holding a mixed portfolio of retail, office, industrial and other property throughout the UK. The Schroder UK Real Estate Fund may also invest in collective investment schemes and other assets relating to property investment. What is a high risk rated fund? Utmost funds with a high risk rating are suitable if you are prepared to take a large amount of risk to increase your chance of achieving higher returns over the medium to longer term. If you have an Utmost life policy you will choose to invest in the Life Equity Fund. The Life Equity Fund, apart from a small cash holding for operational management efficiency, will invest entirely in the Schroder Prime UK Equity Fund. This fund’s investment objective is to achieve capital growth primarily through investment in UK equities. The fund may also invest in a wide range of investments including transferable securities, derivatives, cash, deposits, collective investment schemes, warrants and money market instruments. you will be invested in our equity fund which invests mainly in shares which are higher risk assets with the potential for higher growth. you accept that there is a likelihood of large fluctuations in the value of your policy and that you may get back less than you paid in. Utmost funds with a minimal risk rating are suitable if you are only prepared to take a minimal level of investment risk. If you have an Utmost Pension policy you will choose to invest in the Pension Deposit Fund. The Pension Deposit Fund is primarily invested in the Schroder Sterling Liquidity Plus Fund. This fund invests in a portfolio of money market instruments, short term bonds, and other fixed and floating rate securities issued by governments, government agencies, corporate issuers and financial institutions. The Pension Deposit Fund also has cash deposits with leading banks and other financial institutions in the United Kingdom at the highest available interest rates consistent with maintaining maximum security of capital. The fund should not be regarded as a long-term investment but is particularly suitable to preserve the value of investments when the investment outlook is uncertain. The prices of accumulation units in the fund are guaranteed not to fall. Utmost funds with a medium risk rating are suitable for you if you are prepared to take a medium amount of risk to increase your chance of achieving a level of growth over the medium to long term. If you have an Utmost Pension policy you will choose to invest in the Pension Managed Fund. The Pension Managed Fund can invest in all asset classes and is the fund to choose for a medium risk investment leaving the investment decisions to the fund managers. Utmost funds with a high risk rating are suitable if you are prepared to take a large amount of risk to increase your chance of achieving higher returns over the medium to longer term. If you have an Utmost pension policy you will choose to invest in the Pension Equity Fund. The Pension Equity Fund, apart from a small cash holding for operational management efficiency, will invest entirely in the Schroder Prime UK Equity Fund. This fund’s investment objective is to achieve capital growth primarily through investment in UK equities.